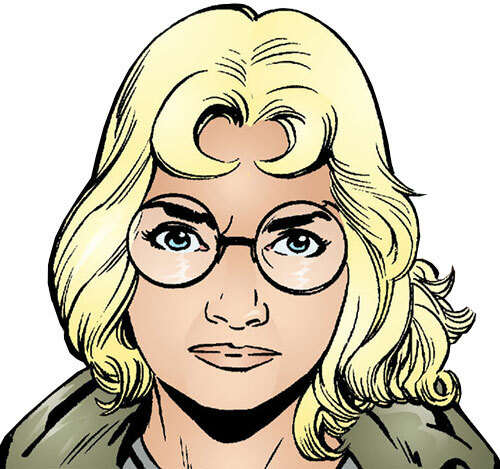 This is the version of fairy tales character Goldilocks who appears in the Fables comic books. 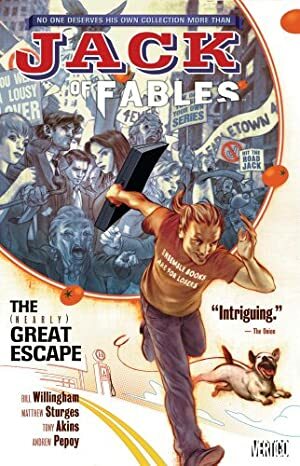 Those unfamiliar with the setting should first read our Fabletown article for context and orientation. Group Affiliation: Former ally of Bluebeard. Height: 5’6” Weight: 135 lbs. 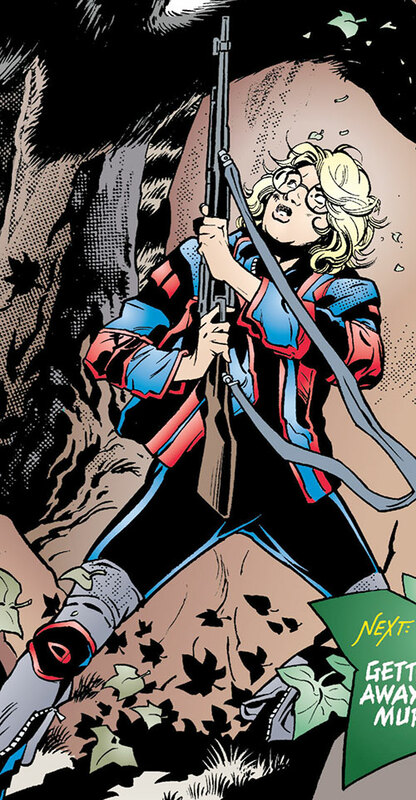 While she possesses no real powers, Goldilocks is an accomplished marksman. Furthermore, her determination to win fuels her in combat. Like all Fables, she is extremely long-lived, and is difficult to kill, allegedly based on the popularity of their tales. 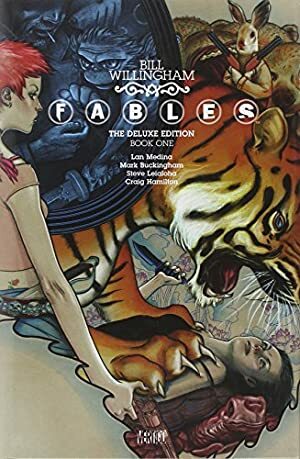 (A fuller history of Fabletown can be found in the main article). Once upon a time a girl called Goldilocks found a cottage in the woods. She encountered the three bears who lived there. When the Adversary’s forces reached her lands, she and the bears fled. They eventually ended up in the mundane world. Goldilocks was never happy in Fabletown. She grew increasingly resentful of all the beautiful people seeming to get their own way. She worked for a while in the Business Office’s restricted chambers, collating the spell books and magic items. But her volatile temper eventually saw her sent to the Farm. She lectured the Farm residents with political propaganda. Goldilocks conspired with the discontent to revolt against the human fables and use mundane weapons in retaking the Homelands. She and Boo Bear became lovers, although she may have been using him to get his parents’ faction’s allegiance. Her main goal was to become governor of Fabletown. They took Farm administrator Wayland Smith captive.&emspHowever, they had to change their plans when Snow White arrived early for the Farm inspection, escorting her sister Rose Red there for her community service. Rose apparently joined the revolution, and prevented Goldilock from killing Snow when she was captured. Goldilocks fled when the revolutionary forces were outmanoeuvred, but not before shooting Snow in the head. Thanks to their fable nature, Snow survived. Going to ground, Goldilocks took Bluebeard as a lover and ally. When he suggested a plan to get revenge on Snow White and Bigby Wolf, Goldilocks readily agreed. Bluebeard had Bigby and Snow enchanted to go on a camping trip together, where Goldilocks would be able to kill them without distractions. She followed them to their destination. But trouble getting hold of a gun meant the magic was wearing off by the time she caught up to them. She shot their car off the road, and followed them into a hasty ambush. 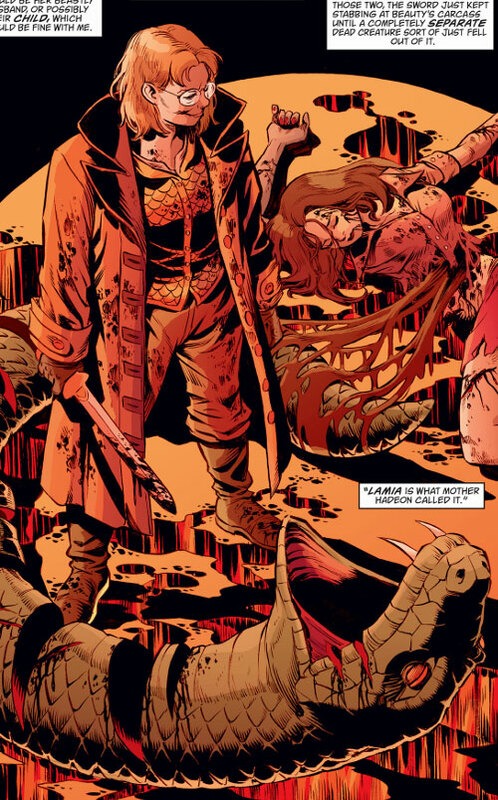 She shot Bigby, and kept shooting him until she could light a bonfire to burn him on. But Snow caught her from behind, planting a hatchet in her head. Disoriented, Goldilocks still tried to get at Snow. She was only stopped after stumbling into the path of an oncoming truck, which sent her flying into a river. Even this didn’t finish her, and she drifted for days or weeks, constantly drowning – and being eaten by fish – but never dying. Goldilocks was eventually dredged up by Mr. Revise, head of the Golden Boughs Retirement Community. 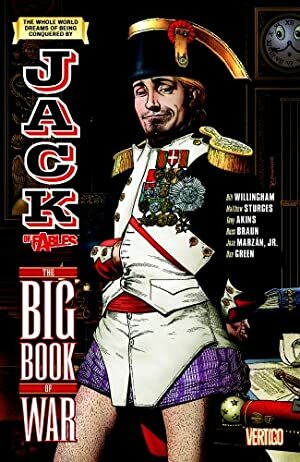 He disliked fables, and was able to erase them from public awareness over centuries. In the meanwhile he kept them prisoners at Golden Boughs, which was where Goldilocks ended up. Goldilocks accepted Revise’s offer to become his secret informant among the prisoners. She looked for a way she could use it to her advantage. When Jack Horner was captured, Goldilocks quickly attached herself to him, encouraging his escape plan while reporting its details to Revise. When Jack took a spur of the moment decision to move the escape up, Goldilocks hadn’t the time – or the inclination – to warn Revise. They broke through the defensive perimeter and separated into smaller groups, Goldilocks sticking with Jack. He turned on her, revealing he’d deduced she was a traitor because she wore glasses, just like Revise’s librarians. She’d had enough of the idiot by that point, and he’d served his purpose. She tried to push him head first down a narrow well, so he could drown without dying, as she had. Jack got the better of her, and shoved her down the well instead. Revise soon recovered her, taking her back to Golden Boughs for further punishment. When the community was assaulted by the Bookburner’s forces, Goldilocks organised an insurgency among the Golden Boughs community. 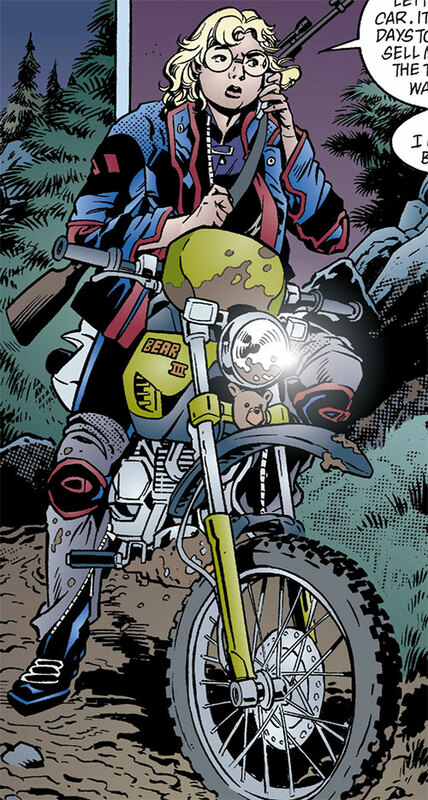 She led her forces to join Bookburner’s, but was the first of them shot by their intended allies. She didn’t die, of course, and with Golden Boughs destroyed she was free once again. Stuck in the fable land of Hybearnia for a while, Goldilocks jumped at the chance when Farm fable Stinky (now Brock Blueheart) happened by. She got him to give her a lift in his magic car, which was actually the transformed witch Hadeon. 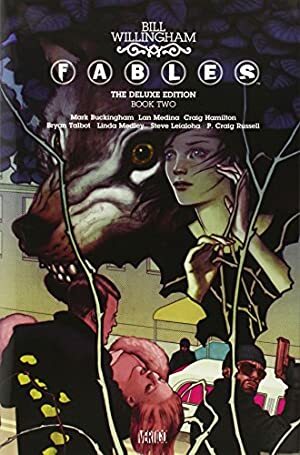 While Stinky slept, Hadeon took advantage of Goldilock’s bitterness to hatch a plot to murder the prettiest fables. 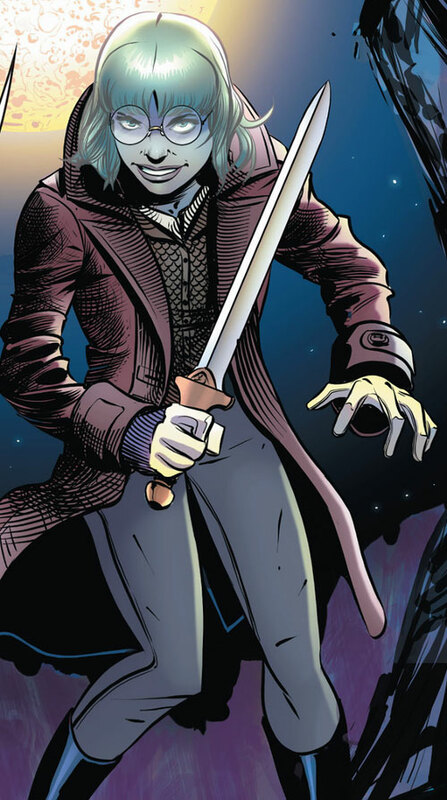 Using Goldilock’s knowledge of the magical items in the lost Business Office, and Hadeon’s ability to reach it, they recovered the sword, Maerorgladi, and the Cloak of Padarn Beisrudd. With these, and the spare set of the keys she’d found to Hadeon, Goldilocks set about killing. When Cinderella was assigned to investigate and given the car to use, Hadeon used her magic to let Goldilocks travel with her without being seen. Cinderella eventually worked out who was behind it, and took them to a deserted world. Goldilocks and Cinderella fought. Cinderella won, killing Goldilocks with her own sword. Whether Maerorgladi’s magic is greater than Goldilock’s immortality has yet to be seen. Bitter and ruthless, Goldilocks has developed a true hatred of the fairest fables. It is especially true of those against whom she has a grudge – which given her temper isn’t a short list. Aggressive and driven, she’ll let nothing get in the way of achieving her goals, sacrificing anyone around her to further her own interests. Goldilocks is relentless when she has a goal. She seems able to fight through overwhelming injury (say, a hatchet planted in her skull) by sheer bloody-mindedness. She isn’t averse to strategic withdrawals should the situation turn against her, but she never abandons grudges. She sees herself as an outsider, ostracised from fable society. Given her temperament the original slight could well have been something minor and unintended. But she’s built it up, her growing aggression making her unpopular and forcing her out by self-fulfilling prophecy. She’s come to link her ostracism as endemic to the inequality Fabletown society is corrupted with. Thus, Goldilocks seeks to rebuild it in a more egalitarian model. When trying to gain followers she often launches into impassioned rants with Marxist tendencies. While these sometimes seem like tools, to get her the power and acceptance she craves, there are other times she seems to truly care about resisting oppression of all kinds. Of course, she sees oppression everywhere. Goldilocks seems to have a preference for taking non-human fables as sexual partners, having had a relationship with Boo Bear prior to the Farm revolt. She also made repeated advances to Bluebeard’s non-human servant, Hobbes, while hiding under Bluebeard’s protection. The Bears (Papa, Mama and Boo – Low). MPR (unspecified vision issue, requires glasses), Minor Rage. During the Farm insurrection Goldie used an unidentifiable Medium Calibre Semi-Auto [BODY 03, Projectile weapon: 04, Ammo: 15, R#03] and a bolt-action scoped hunting rifle, almost certainly a .30-06 [BODY 01, Projectile weapon: 06, Range: 07, Telescopic vision: 02, Ammo: 06, R#02. Limitation: Projectile weapon has No Range – use the Range given next instead]. 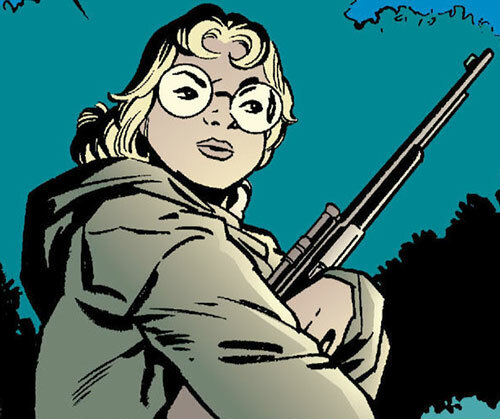 When hunting Bigby and Snow she appeared to use a .378 Weatherby Mark V Elephant Rifle [BODY 01, Projectile weapon: 07, Range: 09, Telescopic vision: 04, Ammo: 03, R#02. Limitation: Projectile weapon has No Range – use the Range given next instead]. In her last appearance she came into possession of Maerorgladi, the Sword of Regrets, and the Cloak of Padarn Baisrudd. Maerorgladi is enchanted so that after being used to kill it forces its wielder to kill another random target. If the user regrets a death caused by the blade within 7 days, they may raise that being from the dead [AV 07, BODY 10, EV 04 (05 w/STR), Miscellaneous Advantage (can raise one victim if death regretted within 7 days), CIA (Killing a second target)]. The powers of the Cloak of Padarn Baisrudd reputedly scale according to the innate magic of the wearer. On Goldilocks it allowed her to alter her appearance to perfectly impersonate another, even down to their scent [BODY 06, Chameleon (includes scent): 10]. She previously had High level connections to Bluebeard, her Connection with the Bears used to be High, and she had a Low one with Discontent and predatory Farm fables. 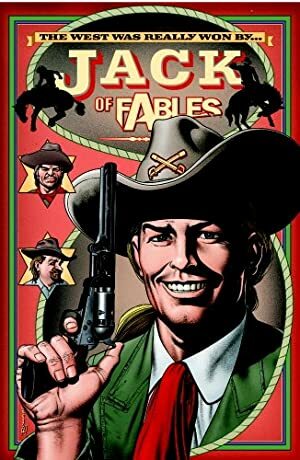 Source of Character: Fables (Vertigo, by Bill Willingham). Helper(s): Wikipedia.com, Roy Cowan, Frank Murdock, Sébastien Andrivet, Darci, Peter Piispanen.